This Saturday, at the New Orleans Fine Arts Center, a broad coalition of New Orleans activists known as the Greater New Orleans Organizers Roundtable will host their second Annual Masquerade Ball and Fundraiser. The Organizers Roundtable is a unique forum for combining efforts in the city's social justice community, and this event represents both a celebration of their efforts, a chance to connect with local activists, and a fundraiser to support the Roundtable's work. The collaboration that would become the Organizers Roundtable began in late 2006, when a group of New Orleans activists began planning for participation in the 2007 US Social Forum. The group was convened by Dr. Kimberley Richards of the People's Institute for Survival and Beyond and Monique Harden of Advocates for Environmental Human Rights. They worked in coordination with a national organizing body that was bringing together the first US Social Forum. The Social Forum began in 2001 with the first World Social Forum (WSF) in the city of Porto Alegre, Brazil. It is not just a gathering, but a process in which a global movement of movements comes together to build popular power. The Social Forum was initiated in response to the World Economic Forum, in which the world's most wealthy and powerful people come together in Davos, Switzerland to set the policies that govern the world. The WSF is a response to that elite gathering. At the World Social Forum, all are welcome, and the gathering is aimed at countering the unaccountable influence wielded by the powerful people who gather in Davos. In addition to the annual World Social Forum, there have been smaller regional forums around the world, to make it easier for poor people from all countries to attend. In 2007, for the first time, there was a US Social Forum (USSF). In keeping with the example set by the World Social Forum, the USSF was convened by grassroots, mostly people-of-color-led, organizations. The New Orleans coalition worked to make sure everyone from New Orleans who wanted to go could, regardless of ability to pay. In addition they worked to coordinate their participation, so that New Orleans activists could convey to activists from across the US the lessons learned from post-Katrina organizing. More than 300 New Orleanians went to Atlanta for the 2007 USSF, including poets such as Sunni Patterson, day laborers from the Workers Center for Racial Justice, former political prisoners like Mwalimu Johnson, and many more. New Orleans activists coordinated several workshops at the USSF, and collectively planned a plenary in which thousands of people from around the US heard from a range of New Orleans social justice fighters. In the aftermath of the 2007 US Social Forum in Atlanta, the New Orleans organizations who had collaborated on USSF participation decided to continue meeting monthly to combine efforts. The group decided at this point to take on the name Greater New Orleans Organizers Roundtable, in tribute to a long-running pre-Katrina gathering organized by the Peoples Institute for Survival and Beyond. These monthly gatherings, usually held on the second Saturday of each month, became an important spot for collaborations and community building. Since its inception, The Greater New Orleans Organizers Roundtable has become a crucial resource for New Orleans’ social justice community. Through an intentional process of trust and community building, The monthly meetings of the Roundtable have become a support and information network for a broad spectrum of organizations working on a variety of social justice issues in Greater New Orleans and throughout the Gulf South, ensuring that member organizations are informed about members’ campaigns and initiatives so that participants can share skills, information, and resources and support one another in their struggles. The Organizers Roundtable actively contributes to creating a vibrant local and regional movement that prioritizes the voices of oppressed people and nurtures alliances across race, class, age, nationality, and gender. In 2010, the Roundtable worked to plan New Orleans participation in the second US Social Forum, which was held in Detroit. Although travel to Detroit is much more expensive than Atlanta, hundreds of New Orleanians were still able to travel to Detroit and continue their participation in this process, along with more than 10,000 activists from around the US. 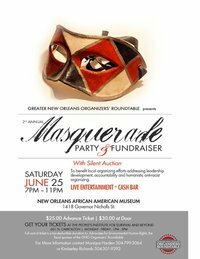 The Second Annual Masquerade Ball and Fundraiser presented by the Greater New Orleans Organizers Roundtable will be this Saturday, June 25, at 1733 Constantinople St, from 7:00pm - 11:00pm. Tickets are $25 in advance and $30 at the door. The party features food and cold drinks, a cash bar, silent auction, musical performances, and a DJ. Masks are available for purchase at the door. The funds raised from the sale of admission tickets will be used to support community organizing and advocacy. You can purchase admission tickets at the Peoples Institute for Survival and Beyond ( 601 North Carrollton Avenue in Mid-City) or by emailing Derek Rankins Jr. at D.Rankins@gmail.com.